It’s possible that some of us are feeling particularly braindead for reasons they can’t quite but their finger on but that they think are due to various stressors and the impending holiday, and it is possible those people asked their friend for something to write about today and their friend said immediately: “should you put whipped cream in coffee as an every day treat?,” and anyway so should you put whipped cream in your coffee every day as a treat? I’ve only done this a few times to essentially negative results, but I do like the spirit of it very much. It’s so nice to have a fun treat, a small decadence. And coffee is already the best part of the day, which is sad, because it is also the first part, but still, it’s nice to have it and it’s nice to make it even a little more special with something like a nice mug or, sure, whipped cream. But does the amount of fun it is to put whipped cream on coffee overcome the fact that the tastes don’t go together particularly well — at least speaking about grocery store can whipped cream — even though you think that they should? What does online say? Oh, this article says that coffee and whipped cream is a drink in Austria called the Cafe Melange. Huh. It’s true, says this website. Maybe you should have it every day as a treat? It’s apparently very popular in Austria (like I said), Switzerland, and the Netherlands. I bet they have it every day as a treat, in those places. What else does online say? Oh, here’s a video. This is a multimedia post now. Wow. This video is actually great and I highly recommend watching it. One of the best things you can do online is type anything into YouTube search and see what comes up, like “I’m sorry [your friend’s name]” if you need to tell your friend you’re sorry or “I’m running late boss” if you need to tell your boss that you’re running late, and then you just pick one of the videos. Anyway in this video a high school student, I assume, teaches you how to make “gourmet coffee” in your home by putting whipped cream in it. “It doesn’t actually go as easy as it looks,” he warns, because the whipped cream can shoot out really fast and you have to be careful. Incredible. This video is amazing. I thought this post was going to be only pretty good but actually it’s great. And it’s quite delicious. But don’t abuse it – it’s quite heavy, after all and can mask all the coffee notes. I’m fonder of black coffee, though​ – I rarely add anything to it. But this is quite a good option. 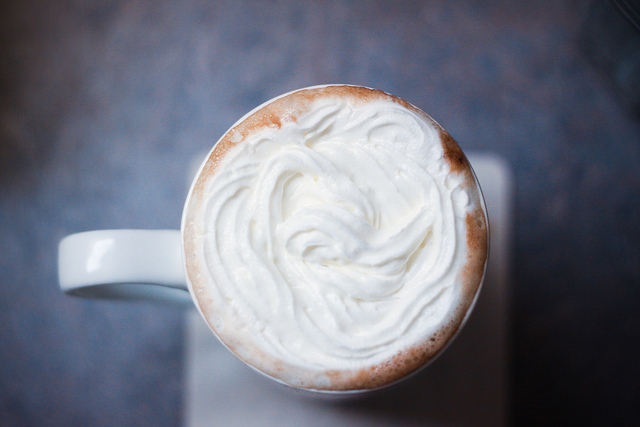 So, should you put whipped cream in your coffee every day as a treat? Hm. My final opinion is that if it’s coffee you didn’t spend a lot of money on and you have fun doing it, yes. Especially during the holidays, and definitely on Thanksgiving morning.